MIDTOWN Vancouver condos is a fine collection of 41 generous sized 1 and 2 bedroom residences located in Mount Pleasant neighbourhood off Main Street and on Broadway. At home in Mount Pleasant Vancouver at an affordable price. Intrigued? Steps to the vibrant and invitingly eclectic shopping of Main Street, as well as being just minutes to downtown Vancouver, the Seawall, plus top ranked schools, parks and restaurants, the MIDTOWN Vancouver Mount Pleasant homes are ideal for any urbanite seeking a central location, affordability and true value. The presentation centre and display home for the Mount Pleasant Vancouver MIDTOWN condos is set to launch previews in Spring 2014, so stay tuned for more information about this project located at 589 East Broadway Vancouver. The homes will be situated above ground level retail space. MIDTOWN Mount Pleasant condos will have a brick clad exterior and oversized windows allowing lots of natural light and ambience into your new home. In addition, the project will include a 5 storey mixed use residential and commercial/retail (ground floor) boutique low-rise with a central Vancouver Eastside locale that is both established as it is excitingly eclectic. Some of the upper floor units will have fabulous 180 degree mountain and/or city views and many of the homes have large covered patios for generous outdoor living spaces. The location is also very close to commuter and public transit routes, schools, services, restaurants and shopping. The amenity on site includes a shared elevated courtyard. Living MIDTOWN Vancouver Mount Pleasant homes will feature the National Home Warranty of 2-5-10 years in addition to quality build by Kindred Construction with over thirty four years of local experience. There is restricted FOB system entry into the underground garage, lobby entrance and to the shared amenity spaces in addition to full pre-wiring for in-home security systems. For more details about the project, please visit the Eastside Vancouver MIDTOWN Condo web site at www.livingmidtown.com or you can simply email info@livingmidtown.com for more details. PortLiving has launched its newest project, Midtown Vancouver Mount Pleasant condos located just off Main Street on Broadway. Being a PortLiving exclusive insider you are invited to visit the Midtown Presentation Centre and display suite prior to the general public. Book your appointment today to get in early before the public. Getting in early means a greater selection to choose from. It also means you will have the opportunity to take advantage of introductory pricing and incentives available to only a limited number of buyers. Don’t miss out by booking your appointment today as many have already taken advantage of this exciting offer. Contact a sales representative for details at info@livingmidtown.com. What is Midtown? Mt Pleasant Vancouver Midtown condos is a collection of spacious one and two bedroom condominiums located in Mount Pleasant Vancouver Eastside. We also have a limited number of concrete townhomes. Where is Midtown located? 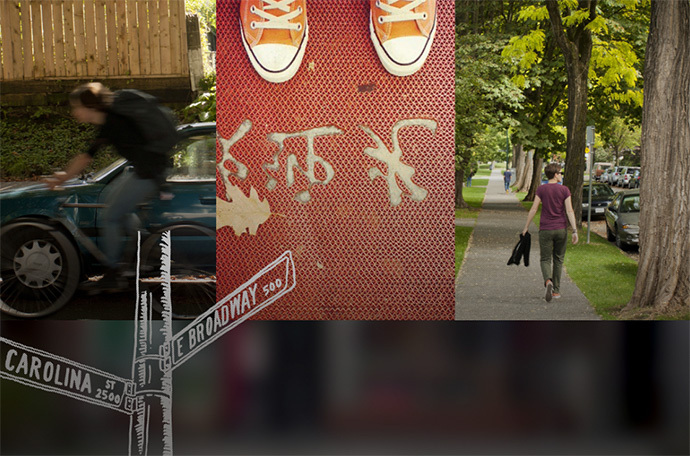 Midtown is located at 589 East Broadway Vancouver, a few blocks east of Main Street at Broadway and Carolina, in a neighbourhood with honest roots. When will Midtown Vancouver Mt Pleasant condos and townhomes start selling? VIP previews have started and will commence over the next couple of weeks with a public open scheduled for April 26th. True one-bedrooms from $289,900! * We urge you to contact us today as VIP Previews will be scheduled on a first come first serve basis. E-mail info@livingmidtown.com to book an appointment today. DON’T MISS OUT. BOOK YOUR VIP APPOINTMENT TODAY. PUBLIC OPEN SATURDAY APRIL 26TH AT NOON SHARP. The kitchens at Living Midtown Mt Pleasant include a high-end KitchenAid stainless steel Architect Series appliance package. This includes an energy saving dishwasher (extra quiet), microwave/hoodfan combo, ceran top slide-in range with convection oven and an Energy Star rated fridge/bottom freezer. As well, the kitchen will have under cabinet lighting, modern pendant lights over the breakfast bar (as per plan) and a stainless steel under mount single compartment sink. The faucet will be by Grohe and the glass tiled backsplashes will be complemented by white quartz stone counters. The cabinetry will be modern flat panel cabients in Jakarta Teak or Carbon Ash. The bathrooms at the Eastside Vancouver MIDTOWN Condos will include quartz counters (like the kitchen) with under mounted square sink and glass accent tile work for the surrounds. The bathrooms will also have clean lined square channel accessories in addition to in floor radiant electric heating. The interior design of the homes will come in 2 designer selected colour palettes (simply dark or light) as well as polished chrome entry fixtures. The MIDTOWN Vancouver Eastside condos will also have custom five inch baseboards, two inch white faux wood blinds for privacy and swing style interior and closet doors. The main living areas will have durable engineered hardwood floors. In addition, all of the Mount Pleasant Vancouver Eastside condos for sale will come with full size front load Whirlpool washer and dryer. The MIDTOWN Townhouses range in size between 1354 and 1407 square feet (indoor living) with three bedrooms and three bathrooms. Both floor plans also have significant outdoor living space around 324 to 326 square feet depending on the floor plan. The MIDTOWN Vancouver condos range from 506 sf one bed and one bath units to 2 bedroom, 2 bath plus flex floor plans over 900 square feet. 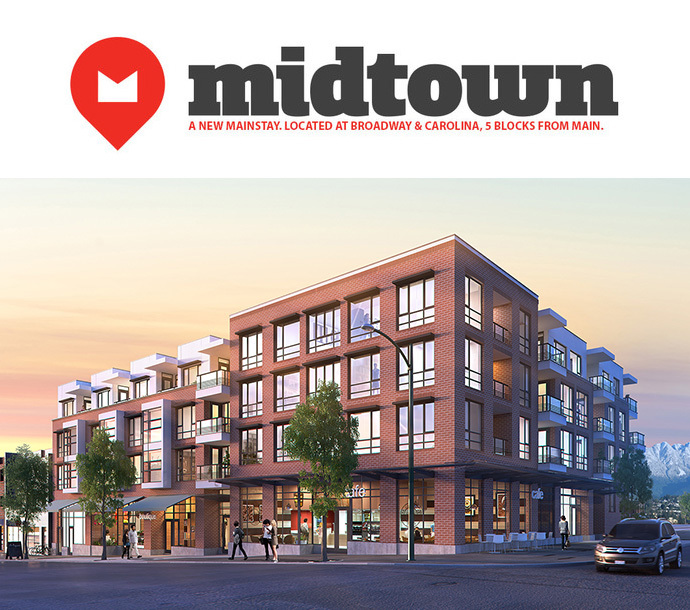 Here’s a quick update on the Mt Pleasant Vancouver homes for sale at Midtown (located at 589 East Broadway Vancouver BC): Blaq Sheep Coffee is now confirmed as the anchor tenant of Midtown Vancouver’s ground level retail space, which is very exciting for those who love a place to unwind, have a coffee, socialize or read. The presentation centre and the Midtown Experiment pop-up shops open any day now and it’s an excellent time to check out the exciting local retailer and entrepreneurial start up business, as well as to take part in a survey that will help shape your community here at the Mount Pleasant Vancouver Midtown condo project. There are only a few Midtown Vancouver townhomes for sale at this boutique development, so they are very unique and rare. Don’t miss out on this great opportunity which represents one of the very first projects in the Mount Pleasant district in some time. In addition, the Vancouver Mt Pleasant real estate development will also include the sale of one-level apartment residences! PortLiving is a globally oriented residential property and lifestyle firm focused on marketing and developing real estate projects in Vancouver, Canada. Our main goal is to enhance livability by maximizing the benefits of a development’s location through design, commitment to quality, and amenities. Through a combination of these key ingredients, our projects have been praised for their innovation, convenience, value and architectural contribution to the communities we serve. We strive to create working and living environments that are sustainable and practical, and serve to strengthen the city’s identity. In combining our objectives with a fervent commitment to our discipline, we believe that our real estate investments are responsible today … and tomorrow.